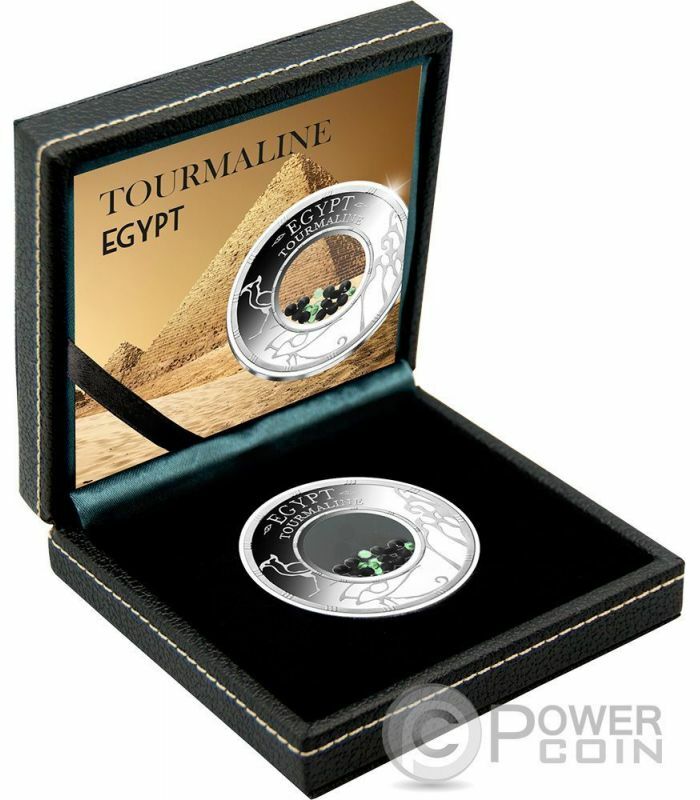 This beautiful Silver coin is dedicated to the Tourmalines gems, semi-precious stones, the treasures of the Ancient Egypt. 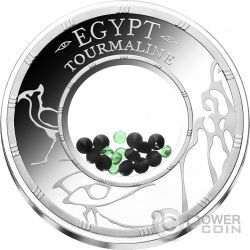 This coin has the special inserts, green and black color gemstones, that make the coin very attractive, has a Proof quality and will be shipped in a beautiful box, with the Certificate of Authenticity. Limited mintage to 999 pieces worldwide. Tourmaline is a crystalline boron silicate mineral compounded with elements such as aluminium, iron, magnesium, sodium, lithium, or potassium. Tourmaline is classified as a semi-precious stone and the gemstone comes in a wide variety of colors. The name comes from the Tamil and Sinhalese word "Turmali" or "Thoramalli" which applied to different gemstones found in Sri Lanka.Brightly colored Sri Lankan gem tourmalines were brought to Europe in great quantities by the Dutch East India Company to satisfy a demand for curiosities and gems. At the time it was not realised that schorl and tourmaline were the same mineral (it was only about 1703 that it was discovered that some colored gems weren't zircons). Tourmaline was sometimes called the "Ceylonese Magnet" because it could attract and then repel hot ashes due to its pyroelectric properties. Tourmalines were used by chemists in the 19th century to polarize light by shining rays onto a cut and polished surface of the gem. 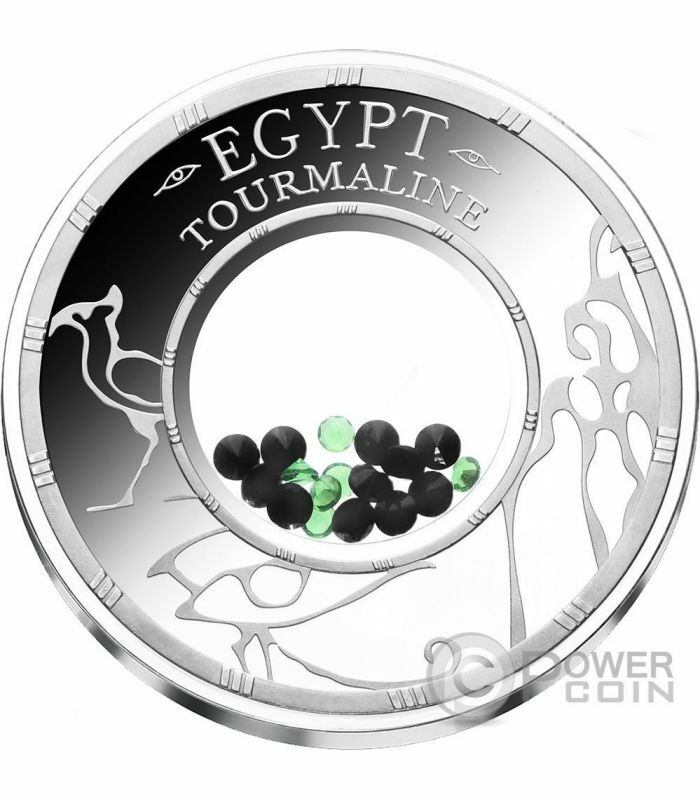 The reverse of the coin contains the Tourmalines gems, the treasures of the Ancient Egypt. These gorgeous stones are in the center of the coin in a special transparent capsule that offer a large visibility of the colored gems. All around of the gemstones, the egyptian symbols and the inscriptions: “Egypt” and “Tourmaline”. 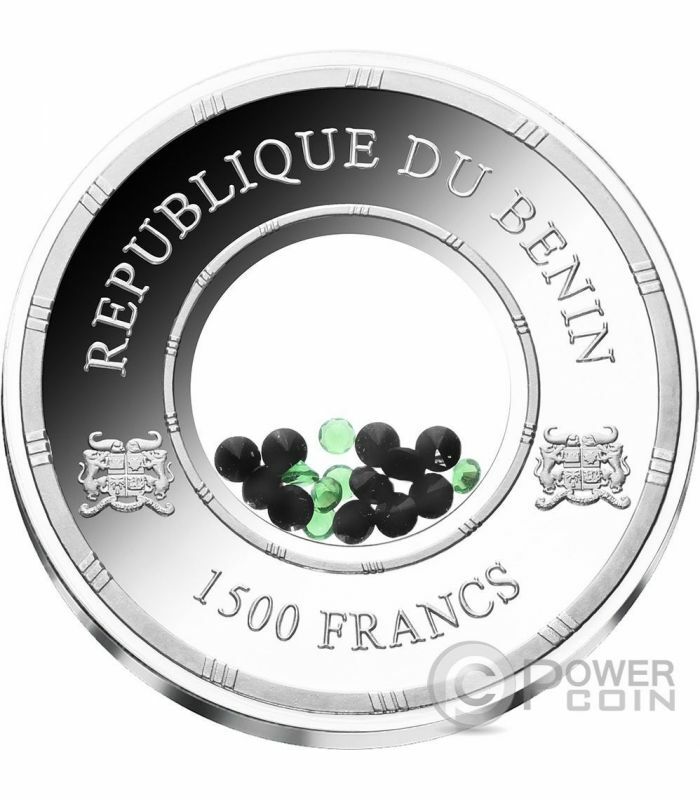 The obverse of the coin contains the same capsule with the crystals, all around the Coat of Arms of Republic of Benin and the inscriptions: “Republique du Benin” – the issue country and “1500 Francs” – the face value.